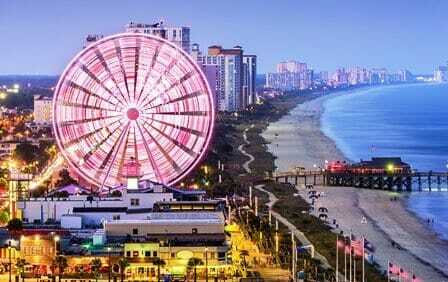 This four-day seaside adventure takes you to Myrtle Beach – the premier family travel destination in South Carolina! The weather there is fabulous year-round, so whether you’re heading out for Spring Break or just want to beat the Winter Blues, Myrtle Beach is the place to go! You’ll love her miles of beautiful, wide beaches and her classic Boardwalk loaded with popular area attractions and entertainment and you’ll thrill to her endangered animal preserve experience and your very own Alligator Adventure. You’ll enjoy old-fashioned amusement park fun at Broadway on the Beach, a visit to Ripley’s Aquarium, a shopping spree at Tanger Outlet’s mega-mall – and more! Perfect. Beach Time! Myrtle Beach Shores Celebrate day one of your grand, four-day Myrtle Beach getaway with some good, old-fashioned beach time! The area offers 60 miles of wide, sunny beaches for you and your young itinerants to enjoy. Kick up your heels in the bubbling Atlantic surf, challenge your group to a sandcastle building contest, throw down your towel and stretch out on the pristine white sands, or enjoy the beach sport of your choice - whether it’s kayaking, parasailing, surfing, and fishing. You’ll even find the three-story Hippo - the world’s largest inflatable waterslide - on the section of beach between 1st and 2nd Avenues! Stroll the Boardwalk A 1.2 mile-long Oceanfront Boardwalk and Promenade traverses the sands from the 14th Avenue to 2nd Avenue Piers in Myrtle Beach; all summer long it’s home to exciting festivals and events, including Ocean Boulevard's Hot Summer Nights at Plyler Park in the heart of the downtown area. You and your group will revel in a classic Boardwalk atmosphere while exploring the vibrant array of shops, eateries and amusement attractions featured on this popular family fun thoroughfare-by-the-sea! Ripley’s Believe It or Not Museum Craving something wild? This is the place to go for a “fast freak fix”! The Myrtle Beach Odditorium – “Just North of Unusual” - regularly serves guests hankering for something gruesome a heaping helping of “super creepy” tossed with a special dressing of “now, that’s crazy”! You’ll find a 19th Century Vampire Killing Kit, authentic shrunken heads, a six-legged pig and a Mexican Vampire Woman alongside other disturbing delights on its macabre menu of more than 200 exhibits. It’s also where you’ll encounter mind-boggling optical illusions, a Haunted Adventure, a 5D Moving Theatre, Ripley’s Mirror Maze – and much, much more, believe it or not! T.I.G.E.R.S Preservation Preserve This fabulous 50-acre wild animal preserve allows its guests to encounter and interact with a variety of endangered wild creatures – some of them even uncaged - on an innovative and exhilarating three-hour guided tour! You’ll meet lions, tigers, wolves, lynx, chimpanzees, leopards, servals and other residents of The Institute of Greatly Endangered and Rare Species Preserve. For the duration of your excursion, you’ll be shadowed by skilled photographers and videographers who capture your group’s amazing experience – preserving a lifetime of memories of this amazing, one-of-a-kind adventure for all to share. Alligator Adventure After your T.I.G.E.R.S. encounter, you’ll be heading into the heart of Alligator Adventure, the reptile capital of the world, where you and your students will come face to face with the beautiful, fascinating and terrifying inhabitants of one of South Carolina’s most popular attractions. Witness live feedings and handlings of A.A. inhabitants, see the largest crocodile on Earth, discover exotic lizards and frogs, meet the resident gray wolves, pink flamingos, and Eurasian eagle-owls, explore Kangaroo Crossing – and more! Tanger Outlets Who doesn’t love to browse for top-quality bargains? Tanger Outlets – a name synonymous with great value, high quality and excellent brand-name selection - tenders you and your travel companions a perfect “shopportunity” at their Myrtle Beach mega mall featuring everyone’s favorites at knock-out prices! You’ll find Hot Topic, Claire’s, Coach, Tommy Bahama, J. Crew, Aeropostale, Lucky Brand, Banana Republic, Gap Factory, American Eagle Outfitters and more at this super-cool assemblage of awesome retailers. Everyone knows shopping is hard work; a variety of your favorite snack shacks and eateries including Pretzel Perfect, Five Guys, Starbucks and Steak ‘n’ Shake ensure a refreshed and energized Tanger spree! Myrtle Waves Water Park Day three is all about fun, and you’re going to wake up and jump right into your exciting itinerary with a trip to Myrtle Waves, South Carolina’s largest water park, boasting 20 crazy acres of swerves, curves, waves and chutes and more than one million gallons of water! A variety of family-friendly attractions, slides and raft rides promise you and your group all the wild, wet and wacky entertainment you can handle, and full-service private cabanas let you lounge – or live it up – with cold drinks and pizza, poolside. Ripley’s Aquarium In the true Ripley’s tradition of showcasing amazing entertainment, the Ripley’s Aquarium tenders an 85,000 square foot marine adventure just waiting for you and your group to dive into - an experience you will remember for a lifetime! Popular Dangerous Reef lets you walk beneath the water, where you’ll mingle with snappers, tarpons, grunts, squirrelfish, a green sea turtle, giant stingrays, sawfish and sharks as you wend your way through a crystal-clear acrylic tunnel. You’ll explore a painstakingly-recreated Indo-Pacific Coral Reef, meet a dazzling menagerie of beautiful, delicate undersea life including a Pacific giant octopus, sea anemones, living corals, jellies and weedy sea dragons in Living Gallery and encounter more than 100 rays in Ray Bay - touch them if you dare! You’ll also see ferocious, flesh-eating piranhas and prickly little puffers; “cuddle” with a “cute” horseshoe crab and come face to face with some of the largest freshwater fish species on the planet! Broadway at the Beach Since its inception in 1996, Broadway at the Beach has become the area’s top destination, drawing more than 14,000,000 visitors annually. This bustling 250 million dollar entertainment and dining complex, set on 350 acres in the heart of Myrtle Beach features three theaters, over 20 popular restaurants, more than 100 specialty shops, and an exciting array of family-style attractions and top-notch accommodations, all on Lake Broadway. Whether you’re down for a helicopter ride, fantasy golf, and a U.F.O Experience or a visit to Ripley’s Aquarium, an afternoon at the waterpark and some good, old-fashioned amusement park fun, it’s the perfect place to while away a few hours or spend your entire vacation! Shop ‘til you drop, feast ‘til you can feast no more and ride ‘til you’re dizzy; Broadway is the place to be and be seen in Myrtle Beach! WonderWorks 50,000 square foot WonderWorks, situated on Broadway at the Beach, is touted as an amusement park for the mind. Guests pass through the “inversion tunnel” (WonderWorks was flipped upside down in a mad experiment gone awry!) to encounter more than 100 amazing and engaging exhibits! Visitors will enjoy a variety of experiences including being caught in hurricane-force winds, landing a space shuttle, getting comfy on a bed of 3,500 nails, piloting a fighter jet, designing and riding a 360-degree virtual roller coaster and competing in a game of laser-tag! We’ve all wondered what it must have been like to be cast adrift in the dark, icy North Atlantic after the good ship Titanic met the iceberg. Here’s your chance to experience those deadly conditions for yourself: see how long you can hold your hand under the surface of icy 28-degree water once the timer begins! Oh…and hey! Are you up for a game of “Mind Ball”?